Caption slip reads: "Photographer: Snow. Date: 09-04. Reporter: Parker. Assignment: Sgt. 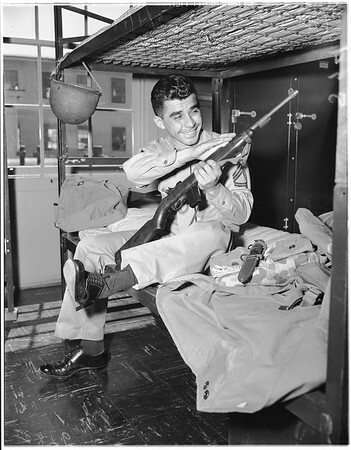 Ward back in Marines -- Camp Pandleton. 53-54: Private First Class Chuck Hoonan issuing gear to Technical Sergeant Bob Ward. 11-73: Technical Sergeant. Bob Ward entering barracks. 74-47: Technical Sergeant Bob Ward cleaning his rifle. 48-25: Sergeant Major D.L. Sanborn & T/Sgt. Bob Ward".